songs for seeds is not only about the music (although our music is reeeaaallly good). At songs for seeds we engage kids all while laying the foundation of early childhood education through musical activities. In each songs for seeds class, your child will hear music from a different region of the world, be exposed to a variety of rhythm patterns and be given the opportunity and space to experiment with singing and playing real instruments. We reinforce their knowledge of colors and shapes, focus on single digit numbers and practice counting. We also highlight animal recognition through animated impressions of their sounds and movements. Did we mention they will also play and have fun? Not just a normal amount of play and fun -- but crazy amounts of play and fun! Well because it’s fun…and because children learn through play. 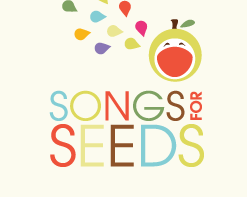 Join us in songs for seeds! From magic tricks, to shapes/colors, foreign languages (hello & instruments of the week/dance party), and of course exposure to rhythms and instruments, the class literally encompasses everything a music class should. There's so much that fits into the 45 minute session and it's done so in a very fun, fluid-like manner. I love the musical instruments from the different countries - it's such a well rounded program bringing together all different parts of the world. As an adult, I find myself learning about things I never knew. check out our songs for seeds testimonial video!